Using a Palm Single in Sideswiper mode. It is magnetically attached to a solid steel base. That means that touching either side of the paddle closes the tip contact of the key jack, rather than operating the ring and the tip independently. 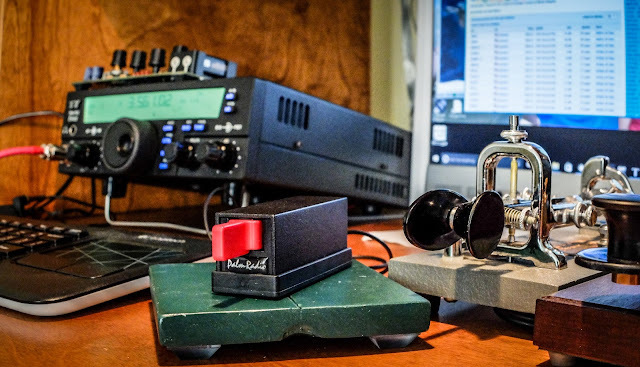 Morse Express has an article with an excellent description and history of the cootie key here. I had some interest in operating a sideswiper because a good friend of mine Kurt (N4KJK) uses one regularly and I admire his skill with it. I spent a short time in 2015 practicing with my Palm Single as a sideswiper and was horrible. I quickly gave up. Now with another year of CW in my brain and different types of keys (straight, iambic paddle and bug) swimming around my consciousness I took another shot. I figured that I would spend an hour practicing side-swiperry and if I was making some progress I would continue the process, and maybe build a real side-swiper key using a hacksaw blade. Before building a key I wanted to practice with what I already had. 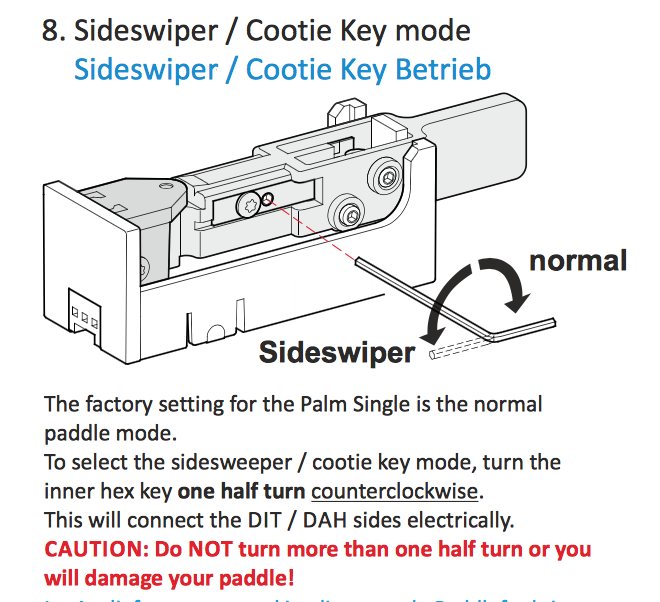 I spent an hour this morning practicing sideswiper style with the Palm Single in Cootie mode and I went from really terrible to simply terrible, which in my book is great progress. You might have heard that the sideswiper is hard to learn... In general I'd say it is very different to what you may have already learned. If the sideswiper were the first key you tried to use you might have no more difficulty learning it that anything else. The problem is that it's completely different than EVERY OTHER morse key in the way it's operated. "Arrrgh... it burns, it burns"
This is so completely different than operating other keys you simply must practice the mechanics that you've painstakingly built into your hand away to the beautiful simplicity of the cootie. Or at least that's what I'm telling myself. So operating a bug takes some getting used to because you are timing the inter-character element transitions from index finger to thumb rather than an electronic keyer, but at least it's similar enough to a paddle that you are expecting to do the DAHs with your index and middle finger and your DITs are always accomplished by your thumb. The old rules are gone. All your finely tuned muscle memory is thrown to the ether. You are freed of preconceptions of sending code and you become "Ambidextrous" with regard to DITs and DAHs. All your political affiliations are out the window as you now are able to approach a character from the RIGHT or LEFT. Ok I'm obviously just being silly now but maybe you get my point. Give the sideswiper a try. It will absolutely clean plaque out of your brain. I'm fairly certain that just as learning and using Morse Code staves off brain disease... using all 4 types of Morse code keys in a round-robin fashion (Straight, Paddle, Bug and Cootie) will make your brain look like a young Arnold Schwarzenegger back in his Mr. Universe days. 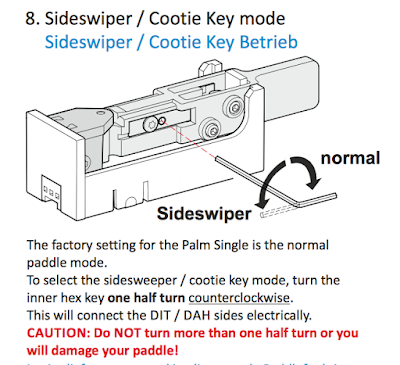 Tim, I agree the Palm single isn't ideal as a Cootie key. I certainly like it for portable operations.